Note a detail that is not irrelevant in the new version of Wordpress, in the setup menu: the word "blog" is replaced by the word "site". This will mark the actual universality of this CMS. Two significant changes go in this sense, the first is the merge of the single user version with the MU version to create multiple blogs on the same site, and the second is the ability to create different types of pages , beyond "Post" and "Page". The default themes provided were neither elegant nor easy to modify. 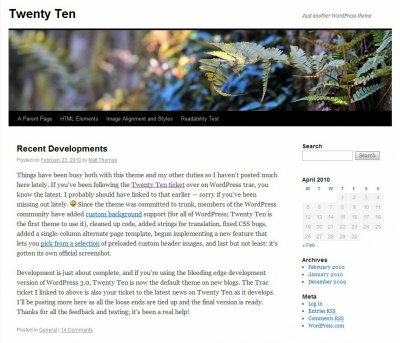 They will no longer be part of the distribution and will be replaced by a single theme, named Twenty Ten. The theme editor now has more templates. A template to include page links appeared. The theme editor allows the user to change the background image and the way it appears, whatever the theme. Wp_login_form function can be used anywhere. If it does allow to log into a page, and so able to edit it directly, rather than moving us authoritatively to the administration interface it is a clear advantage. Conversion tools are added to transform tags into new categories, and conversely to remove a category and replace it with a tag. Next to "Post" and "page", it is now possible as with Drupal (with CCK) to create extra types of contents. There is no need to manually edit the database to create a type. The webmaster can define new fields that will be part of the type and fill it when he create a page of this type. To have a graphical user interface, you must download the plugin Custom Post Type UI. 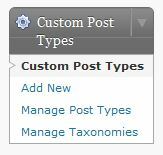 Once installed, a new menu appears at the bottom of the admin panel: "Custom Post Types". The creation of a new type adds also a new menu in the administration panel. It is a step towards Drupal and offers various useful features befitting a more general CMS. The list of new features after broad guidelines been defined at a meeting. This version is described by the authors as a true CMS now. Like Drupal, a bar with administrative functions is displayed at the top. This page remains present while the administrator is logged, on all pages displayed. It allow to add an article while viewing the content. It is easier to create internal links to previous articles in the blog/site with a search button and a tool for automatic inclusion of the link found on the page when editing. When you add a link by clicking on the icon, you have a new option to add a link to a previous article. You can then see a list of pages selected for their relevance. Real help to SEO! That is done from the admin bar present on top of each page. With version 3.0 appeared alternative templates pages. The next step is to allow alternative style pages that you select when editing a post, with a drop-down menu to choose a style. This must be implemented in the theme by the developer. For multi-site, a personal dashboard for each site. A list of formats allows themes to customize each page individually. The list does not stretch, even by a plugin, it must be common to all themes. But a theme can bear only part of the list. The difference with the custom types of pages is that the latter rely on a particular template, included in the theme while post formats rely on meta-data in the page. See Post format and Custom type. From version 3.1 you can have a list of the custom types. A new global panel appears. See Network Admin. The admin panel si refreshed with a new, clean blue style. The writing section is cleaned with less fields, but you can retrieve all of them from the screen options. Full list of changes. Version 3.1 is avaible since February 22, 2011.